Nanci, our San Diego based travel concierge specializing in Disney Destination Vacations, can book any Disney Destination for her clients. She is a Marine Corps wife of nearly 20 years, mother to her two precious girls, and a former elementary and special education teacher. 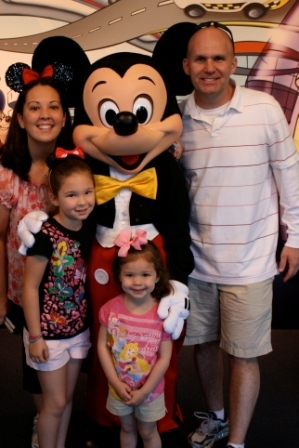 Nanci is a former east coaster and has visited Walt Disney World countless times with family and friends. Though she resides in the coastal community of Solana Beach, she enjoys booking Disney destination vacations around the world. She and her family now enjoy annual passes to Disneyland and have gotten to see a whole new side of the Disney experience! As a foster care family, Nanci and her family feel it is a privilege to be able to share Disney with children that might not otherwise get to experience the magic. Nanci can’t remember a time when she didn’t adore all things Disney. In fact, her first job while in high school was as a cast member at the Disney Store. She truly enjoyed being able to share her love of Disney with the many guests that visited the store each day. 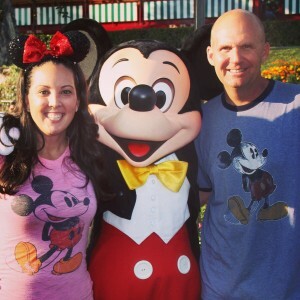 Nanci believes that a Disney vacation is an opportunity for families and friends across generations to connect and have fun together. She feels that happiness is greater because so many people are gathered in the same place, creating amazing memories all at the same time. Nanci will make sure that each and every Disney vacation she plans for her clients will be filled with magical Disney moments. Nanci understands that planning, organization, and attention to detail are key to producing a Disney trip filled with memories that will last a lifetime. Over the years, she has helped many members of her family and countless friends plan a vacation filled with Disney enchantment. She feels it is truly a privilege to now be a part of the Moments of Magic Travel team and delights in spending her days discussing all things Disney! What Nanci’s Clients Think About Her! First of all, our trip was AMAZING! The kids had so much fun, as you could see from our pictures. As did the parents. 🙂 Check in was easy, and we had a great first day at Downtown Disney on Sunday. The room was awesome. The kids were so excited to get the Nemo room. The small details like the mirror and the light fixtures were so true to the movie. It was definitely the perfect hotel as far as theme goes. The two separate beds for the kids and the separate room for us was exactly what we needed. We recommended it to several families planning to vacation there in the next year or two. We walked around the resort later in the trip, and we just loved how well it did the themes of the various movies. The kids also loved the pre-vacation video. It really got them excited. Again, thank you so much for everything. It really was an amazing vacation. I've referred your name to a few people. Hopefully you hear from some! We had a wonderful trip. Our tour guide, Catherine , did a fantastic job. The kids even wanted to go on rides with her. We also enjoyed Animal Kingdom, Epcot, and my husband andI are glad we spent the last day at Hollywood Studios! We want to thank you for all your time and help in planning our Disney World vacation. First off, let me thank you for helping us have a once in a lifetime trip! It was quite magical and we wouldn't have been able to do that as well on our own. Your expertise was invaluable!! Again, THANK YOU...I will continue to recommend you to all my Disney bound friends! It was a pleasure to have you help us with our Disney vacation. We really had the best time!!! The itineraries were great, especially in terms of knowing what we should go to when the parks first opened. That helped tremendously because the attractions you suggested first all had SUPER short wait times first thing but by midday the lines were outrageous! We seriously got to do and see everything we wanted and more, and loved every minute! I can't thank you enough Nanci for all your help with planning our trip. We didn't like Disney when we came in, but are LOVING Disney going out. Everything was seamless! Thank you!!! Our trip was so awesome! We are having major withdrawals! We watched our videos and looked at our pictures from the trip on our tv yesterday and made Mickey shaped pancakes for breakfast! Lol! The times you created worked great for our family especially with little ones! I really liked how you scheduled our fast passes for rides the kids couldn't ride after lunch. It worked perfect for the kids to take a nap then while we rode the rides. We seriously did not wait any longer than 10 minutes for every ride/character meet and greet( even without fast passes). We really enjoyed the character meals! Our reservation times flowed great with our schedule! You did a great job scheduling rides, shows, meet and greets, and parades without having us walk all around the parks. We felt like we could really enjoy ourselves with little ones 2 and under 2! Staying at the Contemporary was super convenient for our family to walk to MK! We had a beautiful view too. When we put the kids to bed we would sit on the balcony and talk and watch the Epcot and HS fireworks. We can't wait to go back. Thank you for ALL of your help! You did a wonderful job! Nanci- we had an amazing time! We did almost everything in the itinerary. We all had a great time and can't wait to go back! Maybe once he returns from deployment! If we get stationed on the east coast next we will definitely need your help planning a WDW trip!! Just wanted to extend my thanks to you for all your help with our magical vacation. We had the best time and cannot wait to do another Disney Cruise. I wanted to tell you a few things about our trip, first our room was the perfect location, central to most everything and our views were amazing. Really, we couldn't have had a better time. It was a great starter Disney Cruise. And you were the key to it being so wonderful. With that being said, we are officially hooked and planning on taking another cruise, we didn't rebook on the cruise, but we want to do a 7 day in the Caribbean next time. We are definitely going to book through you again. And last but not least, Disney World Jan or May 2017. This is still the plan and we will be booking through you. Everything was wonderful. The room location was great at the hotel and the kids loved the trip. Thank you for all your work in coordinating. It was all very much appreciated. Gotta take some time to 'pimp out' my amazing Disney Travel Agent! SUPER impressed with how detail-oriented Nanci was in creating our Disney itinerary packet! It even includes a personalized itinerary and you know I love some personalization. If you are looking into planning a Disney-related trip, even if it is next year, call her now! It doesn't matter which state you are in, she can plan it for you! Oh and BTW, her services are FREE! Thank you, Nanci!! THANK YOU THANK YOU Nanci Ward Weinstein for ALL you do! You are AHHHHHMAZING!! Thank you, Nanci, for helping us plan this amazing trip! So thankful for the wonderful memories! I would have been so overwhelmed without your help. It really was magical!! Our stay at the Grand Floridian was something special for sure! Our room was perfect for us. We had a great view. The amenities at the resort were amazing. The kids loved our downtime at the pools each day. It will be hard to want to stay anywhere else after staying there! All of our dining experiences were great. You had all of the reservations timed well for us. Unfortunately there were a couple we canceled because Tess became ill, but that was unavoidable. The girls' favorite meal was at Be Our Guest. Luke's favorite was the Galactic Breakfast, as you'd expect. 🙂 It was the adults' favorite too. All fast passes were scheduled thoughtfully. We had no conflicts (unless they were self-induced). Our time at the parks was awesome. If you would like to hear details regarding any specific experiences there, I'm happy to supply. The information packet you provided us was amazingly detailed and offered lots of tips that we found very helpful. We felt as though we were fairly experienced in most things Disney, but we got a ton of information from that packet! I'm impressed with the degree to which every detail had been planned. Thank you so much for the care you took in making these arrangements for our family! It truly was a magical experience! Thank you so much for all you time and thoughtfulness in planning our trip! My parents especially kept commenting on how great everything was organized and what a great time they were having knowing everything was planned (and paid for). The meal plan is an absolute steal! We were floored by all the options and the overall money saved. Nanci- we had a wonderful vacation thanks in no small part to the arrangements that you took care of for us. We did not know enough ahead of time to see what you took care of, but now know without you the trip could have been a nightmare. Thank you for everything. We seriously can't thank you enough for everything you did to make our experience so great. I can't think of a single recommendation to offer you. Everything went so smoothly and the itineraries were very helpful in the parks. We had an amazing time and made a lot of wonderful memories. Thank you, Nanci for making our trip so magical!! We had an amazing time! Amazing trip to Disney! So much joy and so many good memories. Thank you Nanci, you made this trip perfectly seamless! I truly don't think it could have gone any more smoothly! You took all the work and gave us all of the memories! Thank you! Thank you! Thank You! A big thanks for all of your support in making Disney Magic happen for our family. We had an amazing time and look forward to doing it again. You made it manageable and fun! Nanci, truly I can't thank you enough! We changed our plans SO many times even from Disney World in FL to Disney Land in CA and even worse we changed our dining plans two days before we got here! Everyone, she is the encyclopedia of Disney, has kind and warm heart, and especially is the most patient agent ever! Strongly recommended! We booked through moments of magic travel and Nanci Weinstein. They were amazing. She sat on the phone with me for over an hour going over every single cruise rate we could find in our budget. We decided on a September 2015 cruise. Best price for the whole year for the type of room we wanted. Highly recommend going through Nanci! We have had such a wonderful time here and it was all due to your attention to detail and planning! Thank you so much for everything and when we come back (which will hopefully be soon) we will be sure to call upon you again! The trip was fabulous and much of that is due to you. Disney's service was great, hotel convenient and your itinerary was very helpful. My husband was especially impressed with your helping us with the Chef Mickey's reservation. (on our drive down to Disney) I also think you suggested the fast pass for Seven Dwarfs Mine, which was a huge hit. When we went there, the wait was 90 minutes long. I can't imagine how long it would have been in the busier months!! Phoebe also really got into the princess dinner at Akershus. That was a nice way to end the day. I will definitely recommend your services to friends. Thank you so much for making this trip a lot easier! I am an experienced Walt Disney World guest. Including this last visit I have been to the WDW resort 20+ times since 1998. Needless to say, I love my vacations there and take them very seriously. I've traveled with only adults and I've traveled with children. My early trips were arranged with the use of a travel agent, but subsequent trips were planned by me and the use of various on-line resources. My experience working with Nanci on this last trip (10/30 - 11/3) was remarkable! And it reminds me how much I love planning trips to WDW. Although I worked with Nanci this time around and she did all of the heavy lifting I was very much involved in all of the details of my trip. I was celebrating my 40th birthday so it was important to make this trip special. Not only did Nanci help with that, but I believe that her involvement was a direct contribution to how wonderful my overall experience has been. Planning an entire WDW trip alone can be exhausting, but as I said, Nanci did all of the heavy lifting for me and pretty much took all the stress away. Since this trip was kid free, that also contributed to a little less stress all around but it also opened up the possibilities of doing things we couldn’t normally do when we have kids with us. Nanci was a great help in weeding through options and providing more details so that I could make an informed decision on the events that would make my trip special. In the end, I was very satisfied with her and the service she provided. I would definitely recommend anyone I know that is planning a WDW trip to talk to Nanci and I most certainly would love to work with her again in the future. Disney World! You do know how to make a family vacation fun! Thanks again, Nanci for making everything smooth and fabulous! Thank you so much for helping to get everything together for our Disney vacation! We couldn't have done it without you! I had no idea the planning could be so organized and stress-free with so little work on my part! We definitely felt spoiled and now we can't imagine doing Disney any other way! Thank you again so much! I still can't express how thankful I am for your services, Nanci! I can't say one thing negative about our experience and I feel so blessed to be provided with such great help from you! You were always available at a moments notice and took so many different things into consideration to make this trip custom fit to our family. I will definitely getting back to you soon to help plan our next memory making trip! After our experience last time, there isn't another person in the world I will use! Best vacation EVER!! It never would have been the vacation that we always dreamed of without Nanci Ward Weinstein!! Nanci Ward Weinstein is my hero!! If any of you out there in the FB world are planning a Disney vacation, Nanci with Moments of Magic Travel is your ticket to low stress planning...a FREE service where your helper gets up at 3am to make sure your princesses meet princesses and book your stuff. Call her...you're welcome! Thank YOU, Nanci, for doing such a wonderful job of planning our days at Disney. Everyone got to do things we enjoyed, and we always had nice sit-down meals. All the advice you gave us was right on! I hate to think of how ugly it would have turned out had we done it all alone. After we got off the phone that night (you, my SIL Karen and myself), Karen (a Disney expert) texted me saying, "She was really great!" and that she couldn't wait to see the itinerary. We all felt very confident with you to help us. Nanci, your input and advice was invaluable! Our trip was wonderful and it was so nice to simply refer to my packet of information and see what was coming up next! We are going on our Disney Cruise soon! Nanci Weinstein was wonderful at helping us book it!! She helped us out tremendously and we are so excited! Thank you, Nanci! It was the best trip ever!! Our thanks to Nanci Ward Weinstein for designing the Disney trip of our dreams! We surprised our girls for their birthday with our first Disney trip this past May. Both my husband and I run our own businesses and time wise nor experience wise had no clue where to begin. Nanci was a God send and had everything set up for us so we had a super fun and stress free vacation to always remember! I tell any one who is going about this service and how in less than two months we created a magical Disney trip! Thanks again Nanci and moments of magic! Nanci Ward Weinstein booked our trip to Disney and she was awesome! We stayed at the Beach Club Resort, which was fabulous! Every detail was taken care of. Next time you are planning a vacation to Disney make sure you contact Nanci. She will make sure it is painless and magical! Favorite Disney Attraction/ride/show? Magic Kingdom–The Disney parades and Fireworks show especially during the holiday season are my favorite! There is just a feeling of enchantment that captures everyone watching the parade! The fireworks are the perfect ending to another magical Disney day! I must admit that I even tear up during the fireworks show, but shhhh that is our little secret! Favorite Disney memory or experience? Wow, this is a tough one to answer because we have so many wonderful Disney memories! However, I must admit that my favorite memory is the look of awe and excitement when each of my daughters saw Cinderella Castle for the very first time. It was as if the storybook had come alive right before their eyes. We were fortunate enough to be able to capture my youngest daughter’s expression as she rounded the corner and right in front of her was Cinderella Castle for the very first time! We also love the dinner shows like Hoop Dee Doo Review and the Spirit of Aloha show!